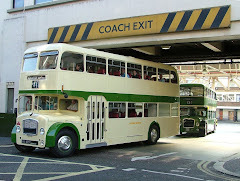 The BusWorks was established in 2007 as a restoration and refurbishment centre for classic and modern buses. In a short space of time we have completed over 150+ projects and our portfolio of services offered continues to grow. "The BusWorks" is now a trading name and operated by Classic Bus North West Ltd.
MD60, one of the few survivors of the 164-strong batch of MCW Metropolitans, is making good progress in the workshop area, following the completion of offside and rear framework repairs. Following side repanelling, work is now progressing on the construction of new engine bonnet and side access door frames which were (like the rest of the bus) severely corroded. Now that the rear framework sections are all renewed, we can safely refit the engine - the bus had almost broken its back due to the extent of framework corrosion and the original rear framework design, which has been improved upon. MD60 is booked in for a respray in original LT red and white livery in early March which will completely transform its appearance.